To create the wool, the future of our life time"
Today it is popular to research one’s family roots. We research archives in countries we have never lived in. We write about periods that passed away decades before we were born. We try to recreate the life of people who have passed away. We search for documents and photos that may have been damaged or destroyed, and try to uncover memories that have faded away or vanished altogether. We strive to get the most out of every record, photo and tale to create the most detailed, comprehensive life history of our families. The memories and stories about our parents, grandparents, and extended families are part of our heritage, and we all attempt to pass our version of history along. Different stories, of course, may exist, and naturally, all of us believe that our version of the history is the actual truth. We will not deny other stories, or challenge them. We can only write down and document those old memories, merge the stories, and open a window to that time. That time is when our ancestors lived in the old country, in my own family case, Belarus, Poland and Israel, before it became an independent state, the Mandate Palestine, long before we were born or able to understand our ancestors’ conversations. Numerous family stories pop up. One story triggers another story and they start a link list of stories. Even though history always follows dates and clear direction, memories comes in chaos, they do not have a clear direction in time. 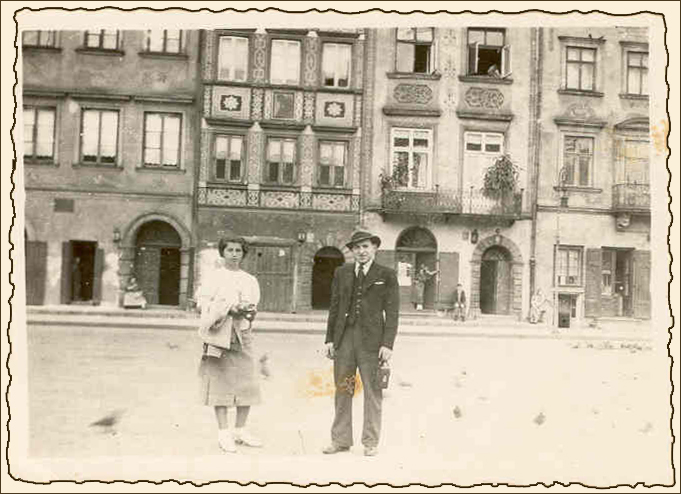 Therefore, it happened that a small pile of tiny photos intrigued me to tell you about my father’s journey from Israel to Poland during the summer of 1935. As we shall see the photos, the identification of people and places, the remaining mysteries and the participation of family members in the process of recreating the story brought up many more stories that are linked to the current story. My father, Ariel Arieli, passed away in 1978 at the age of 59. More than twenty years later, I started to research the family history in-depth. I am sure he would have loved the project. After all, Ariel was an extrovert. He always shared his experience with everyone who was willing to listen. Nevertheless, I do not remember him ever bringing up stories about his journey to Poland. We knew the trip had taken place, but we hardly knew anything about the trip itself. At the end of WWII, Holocaust survivors did not open their heart and did not share their traumas. Relatives of people who perished in Europe also avoided expressing their emotions in public. There was a silence in an attempt to hide the painful, horrendous memories about the Holocaust. Thus my grandfather, Yosef Arieli, never spoke about his close relatives who perished in Poland during the Holocaust. He did not share with us his emotions or thoughts about the torturous fate of his father, brothers, sisters and their families during the Holocaust. In the same way, he never told us about Ariel’s visit with the family in Poland shortly before WWII. Maybe my Ariel’s silence about his trip, like his father’s, was part of the general public behavior in Israel after the Holocaust. Were the memories of those people he met once in his life and who perished few years later too painful to tell? On the other hand, was my father too busy, with his hectic daily life? I assume that the answers to all these questions are positive. 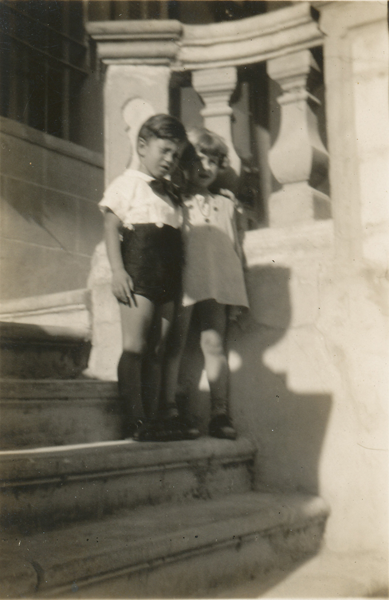 Recently, I asked Ariel’s brother, Yigal, who is now 97 years old about my father’s trip. My uncle’s memory is still as sharp and clear as ever. “Do you remember any of my father’s stories from the trip?” I wanted to know. The people and the places in the tiny photos kept bugging me and I decided to recreate the story of my father’s experience in Poland. My sister Ora and I did manage to find additional photos taken in Poland during Ariel’s journey. Some photos have a note and even a date on the back. My sister, Ora, who has the memory and the eye of an artist, remembers a few details from long ago. Therefore, we sat down together for hours, she in Boston and I in Palo Alto, linked over the phone, and we slowly concocted, from few clues, the story of our 16-year-old father travelling all by himself to Poland, to meet Kaluzynskies, Sznajedremans, Sztatlers and other close relatives. A blank page on the computer screen. The keyboard is ready but my hands are not typing. The unknowns, the unanswered questions hold up the flow of the story. Who were the people in the photos? How are they related to us? Did Ariel write letters during his stay in Poland to his parents or to his girlfriend, my mother Chaya? Maybe, but we did not find any letters. Did he keep a diary? I doubt it. 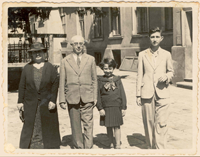 Did my grandfather, Yosef Kaluzynski got letters from his relatives about meeting his son Ariel in Poland? Did they reply? My sisters and I never found any such letters. Before WWII, very few people emigrated from Poland to Israel. My grandparents immigrated to Israel at the beginning of the twentieth century. They left their families while still in their teens. Letters sent through the post were their only means of communication. The prospects for reuniting the family in the near future were very dim. I can only imagine our grandparents yearning to introduce their son to their brothers, sisters, and cousins who lived far away in the old country. I tried to imagine Ariel’s expectations before he left for Poland. Who were the relatives he was about to meet there? 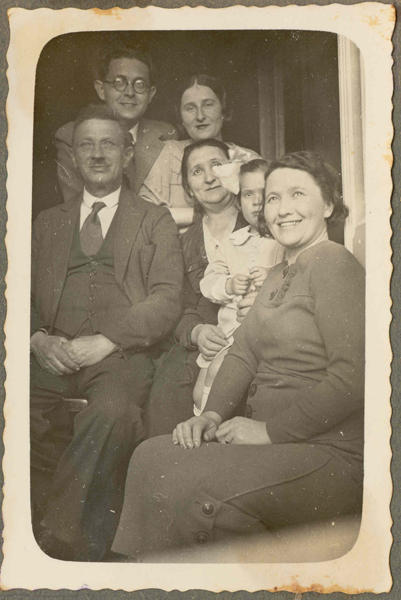 Henrik Kaluzynski, his brother, his wife Hanna Hellman and their youngest daughter Stefa, lived in Czestochowa. The eldest daughter Frania had already immigrated to Israel. 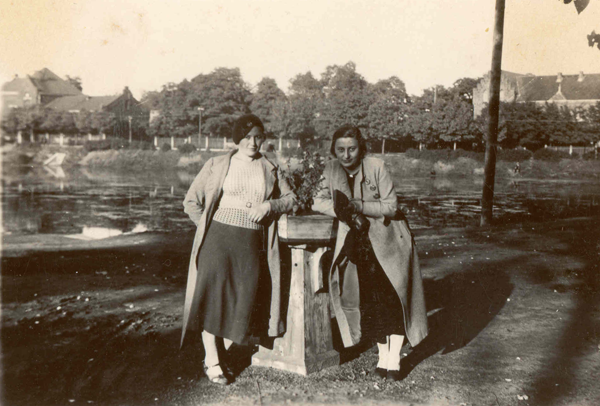 Mania and Guta, his stepsisters, lived around Czestochowa but the exact place is unknown. Stepbrother Marek lived in Poland but his whereabouts were unknown. I will tell his story separately. In this point of my own exploration, I was not yet aware that other members of the Kaluzynski family existed, but came to discover that they also lived in Czestochowa, Radomsko, Piotrkow and other shtetls. 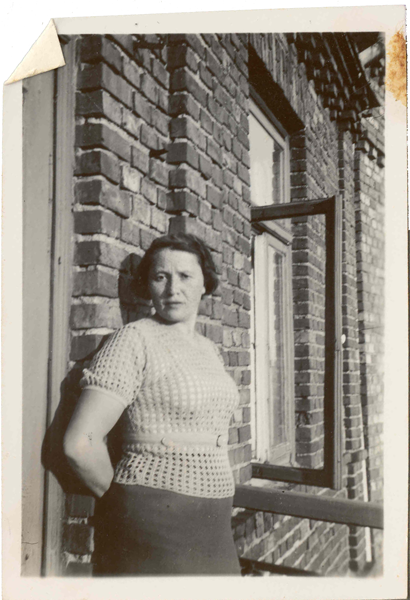 My grandmother, Hanna Arieli Sznajderman, was born in Zawiercie. 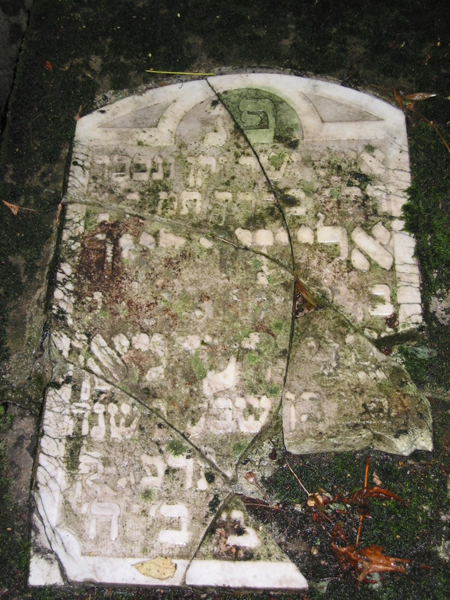 Both of her parents, Eliezer Sznajderman and Eygda nee Sztatler passed away before 1935. Some of her brothers and sisters immigrated to Israel at the beginning of the twentieth century. 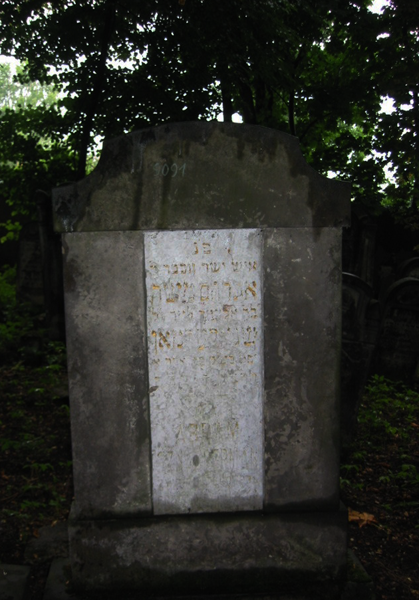 Her eldest brother, Abraham Moshe SZNAJDERMAN, stayed behind in Zawiercie. 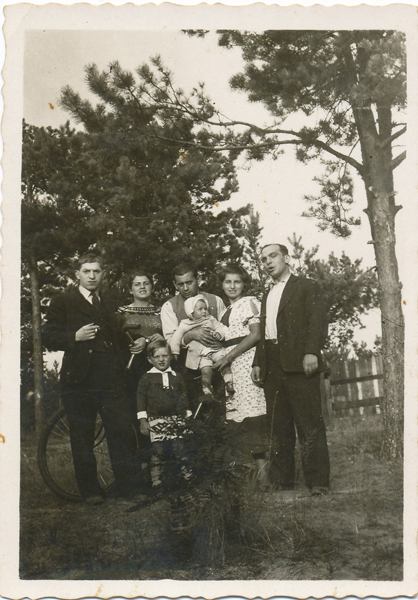 A careful study of Ariel’s photos provides a snapshot of Abraham Moshe’s children when Ariel visited them in Zawiercie. The surname of my great grandmother Eygda was SZTATLER. The story will present us with a vague idea of the whereabouts of the SZTATLERS at the time of Ariel’s visit. Ariel started his journey early in July 1935. Today, as we look back, we know that five years later, almost all these relatives perished in the streets or in concentration camps at the hands of the Nazis. In 1935there were already growing tensions between the democratic and fascist states in Europe. A small pile of miniature photos shed light on Ariel’s trip. His first stop was Athens, Greece. The label on the back of a photo tells us “A Holy place, Athens. July 15, 1935”. I can imagine the spirit of my adventurous father, his own first trip outside of Israel, walking among the sites of Greek mythology. In 1966, I flew to Athens. It was my first trip out of Israel, and as I recall, my excitement was immeasurable. My father helped me to organize the trip, but never mentioned his own visit to Athens twenty-five years before. I wish I knew the route of his trip from Greece to Poland. Who organized his trip? Did he travel by train from Greece through Germany or through the Czech Republic and then to Poland? 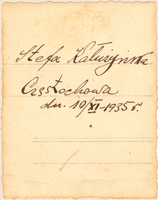 Another photo dated July 3, 1935 documents Ariel’s arrival at Czestochowa, Poland. The dates, as you see, should be treated with some suspicion as slight discrepancies evident. 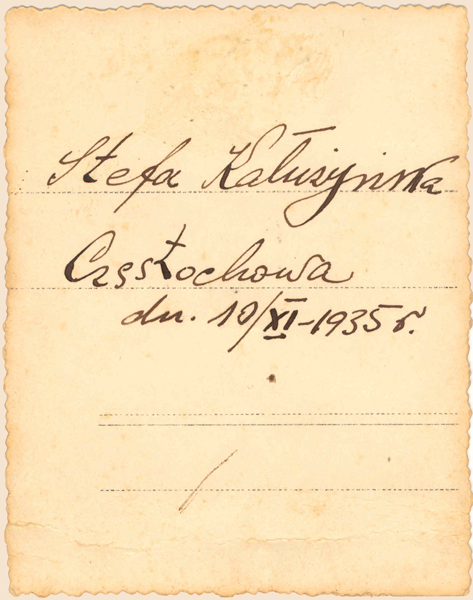 On the back of the photo, my father’s unique handwriting tells us that his uncle Henrik Kaluzynski with his wife Chana (Andreia Hellman) and Mrs. Leibel came to meet him at the Czestochowa Train station. The photo, however, depicts a boulevard, not a train station. Czestochowa does have a Druga (Boulevard), the Aleja Najswietszej Marii Panny. The wide boulevard extends from the former Jewish quarter and ends at the entrance to the famous Jasna Góra monastery. Henrik Kaluzynski and his wife, Hanna, are dressed elegantly as they stand in front of the photographer. Henrik remind us of our grandfather; in fact, one can almost mistake him for grandfather Yosef. Was Ariel the photographer? 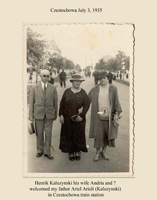 Henrik Kaluzynski, his wife Andrea nee Helman and ? 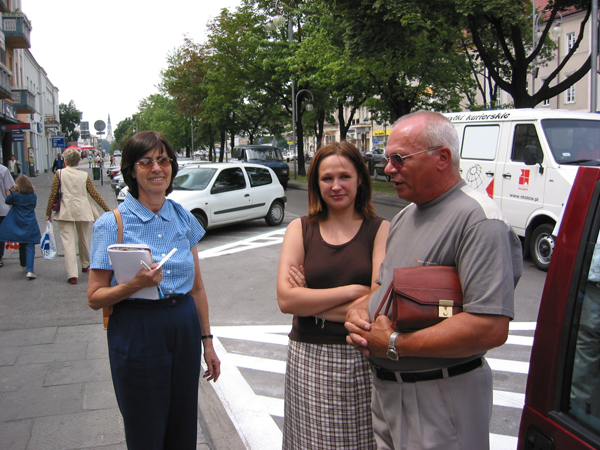 In 2002 Ora, my sister, Amos, my husband, and I visited Czestochowa as you can see in the photo below. The photo background is the same-Aleja Najswietszej Marii Panny. 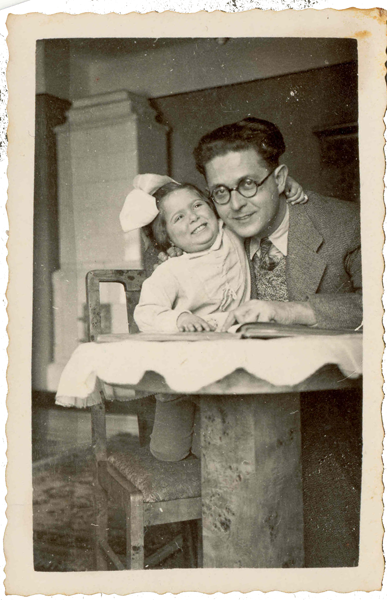 I am on the left, with Andrej Kaluzynski and his daughter, who are not Jewish. I will tell their story separately. I was curious to see a photo of the Czestochowa railway station in 1935. I wanted to experience the sight my father saw when he stepped out of the train in Czestochowa. I sent a message to my friend Tomek Wisiniewski with my request. 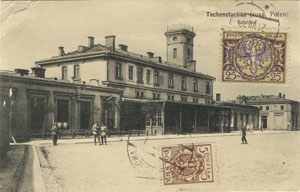 Tomek responded the next day with a photo of the old railway station and some examples of the railway tickets. Henrik Kaluzynski, his wife, Hanna, his youngest daughter Stefa and Ariel posed for a new photo. They are dressed gracefully for the special occasion. What was the name of the boat he took from Tel Aviv or Haifa? Mandate Palestine was under British control at the time, so what kind of a passport did he have? Was it easy to get a visa to enter Poland in 1935? How did he travel from Greece to Poland? How much money did he take with him? Did he travel from one town to another by train? What route did he take back to Israel? One more question keeps looming all over the story. What was the reason for Ariel’s trip to Poland? Did my grandparents dream about sending their son to visit their family in Poland? Was the restless Ariel looking for an opportunity to leave the nest for a couple of months? Again, there is no clear answer. 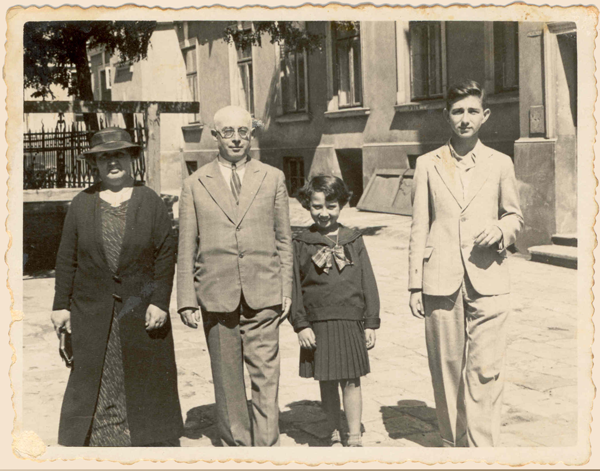 Let us return to our family photo in Czestochowa: Henryk, who looks like our grandfather, his wife Chana, Stefa and Ariel. Stefa and Ariel are first cousins. I have the notion that young girls always adore their older cousins. A big, vivid smile lights up Stefa's face. In a separate photo, the two cousins are marching like soldiers along the street. Stefa's shining face hints of her pleasure in the company of her young guest. This photo is my favorite. There is a special sweetness and charm in the face of the young, innocent Stefa. Ariel stayed in Czestochowa at the home of his uncle Henrik and his family. We get a glimpse into their small apartment. Henrik, Andrea and Unknown Women, Stefa is standing in front. In September 1935, the family posed for another photo. If we ignore the dates on the back of the photos, we would have thought that all of them were taken on the same date. 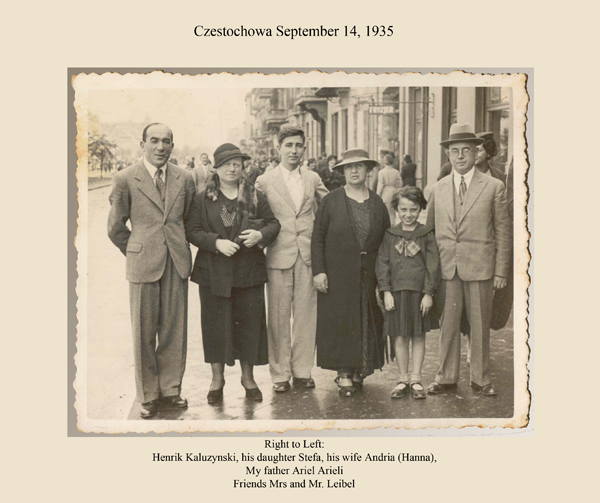 Henryk, Chana and Stefa were always dressed up in the same clothes and the Leibel family was present next to the Kaluzynski family in every photo. Who are Mr. and Mrs. Leibel? Is Leibel a surname or a given name? I had never heard the name in any conversation at my grandparents' home. It appears that they were close enough relatives to participate in the occasion of Ariel's visit. During this period, taking a photo was a special event and Ariel's visit was most certainly a special event. The Leibel family members appear in several photos. In order to try to learn more about the Leibel family, I looked carefully at some photos that I could not previously link to the story. The date on the photo is Sep 17, 1935 and the place Warsaw. The same girl, Mariszia, and an unknown man stood for a photo in front of a solid, brick building. I scrutinized the photo closely and I examined Mr. Leibel in previous photos. There is almost no doubt that Mr. Leibel was standing beside Mariszia, and so he is most likely her father. To further decipher the story behind the photos is very challanging. Is Mr. Leibel or his wife a member of the Kaluzynski family? Is Mariszia their daughter? I have no idea about the other people in the photos. 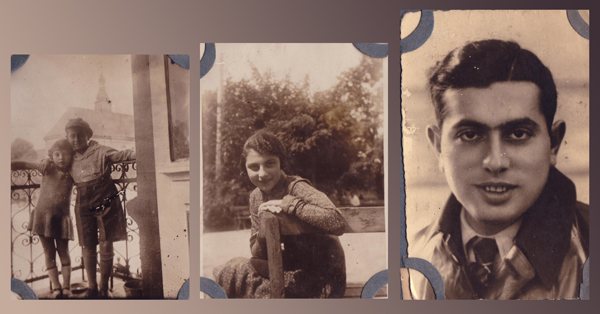 Were they murdered in the Holocaust? Did any of them survive? Are any of them or their descendants still alive? Who else in the extended family can identify them? In a separate detective story, I will unfold the story of how I solved some of the mysteries suggested by the above photos and how I linked Mariszia and her parents, the Fajermans, to the Kaluzynski family tree. 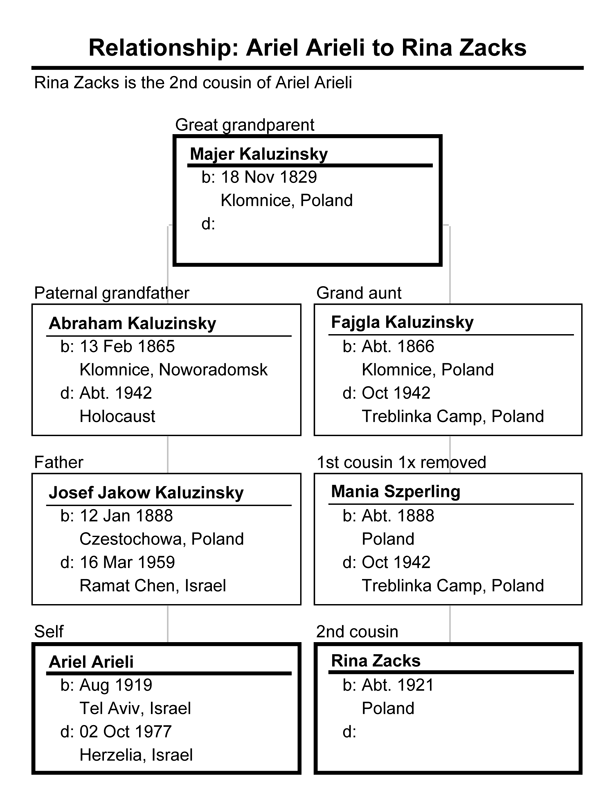 At the time when my father came to visit the family in Czestochowa his grandfather, Abraham Kaluzynski, was alive but for some puzzling reason he does not appear in any of Ariel’s photos. Ariel knew his grandfather when he, his grandfather, came and stayed with the family in Israel several years before. Avraham Kaluzynski’s first wife, Frajdla Szczekacz, died in 1894. She was Ariel’s grandmother. Many member of the Szczekacz family lived in Czestochowa. Did my father meet her family? Did he visit her grave? The photos have no reference to SZCZEKACZ family members. 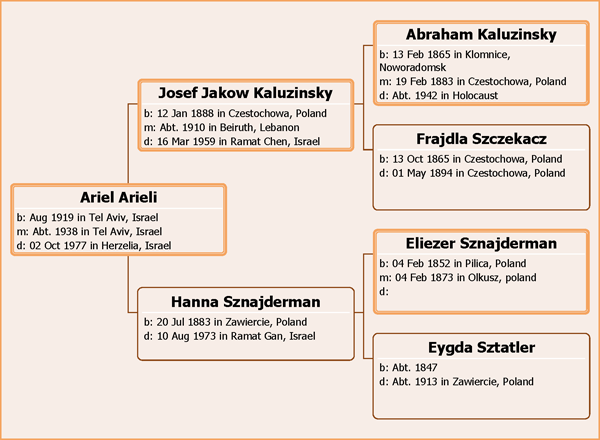 There were more living siblings of Avraham Kaluzynski in Czestochowa and Radomsko in 1935, among them were Laiser Kaluzynski and his family, Udla Librowicz née Kaluzynski and her family. The photos give no hints of Ariel meeting them. 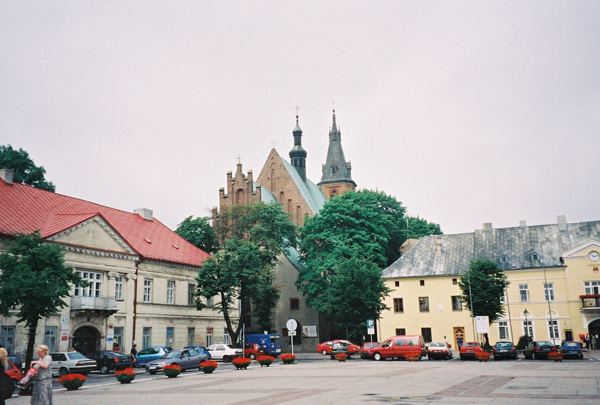 One of the photos however, does, suggest the possibility of a visit to Olsztyn in northern Poland. Olsztyn might be the place where some of the Librowicz family lived. It is not a photo of relatives, but of a historical site. More unidentified photos are scattered across my computer screen like puzzle pieces. I am trying to fit them together. 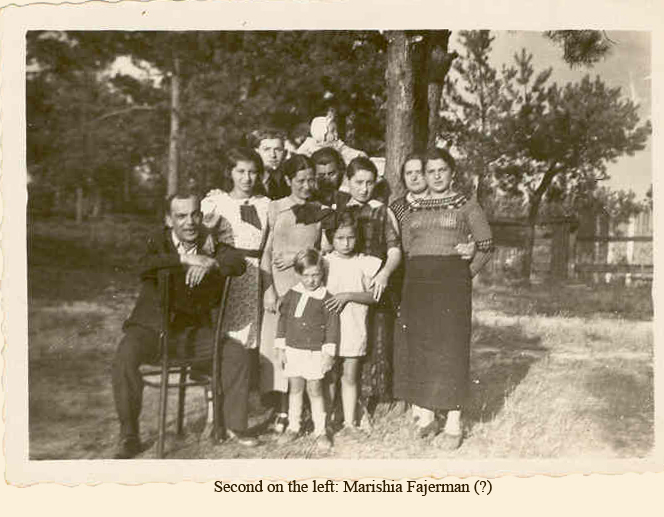 The same two women appear in the next two photos — the woman in a black dress is Guta Sznajderman daughter of Abraham Moshe Sznajderman and the other with a light-colored blouse is unknown. 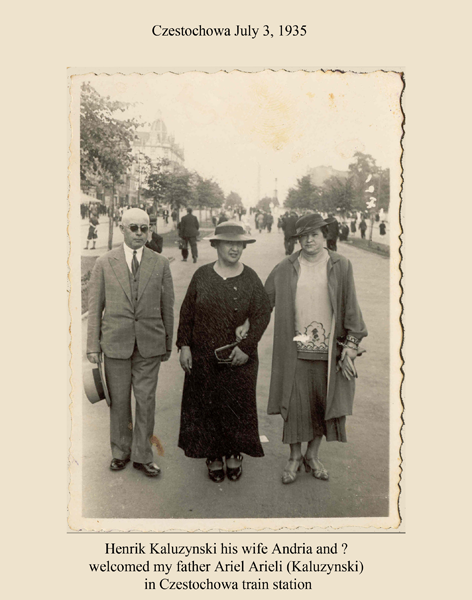 In the second photo Guta (on the left) stands with the same unknown woman and an unknown man. The next photo reveals the view of a room, sewing machine, a massive, ornate closet with a sculpture on top of it. Next to the closet is a decorated window. A small chandelier hangs from the ceiling, and the walls are decorated with a delicate, border design. A small picture hangs on the wall behind the women. A door opens, perhaps to the kitchen and there we can guess is the entrance door with a mezuzah at the side. 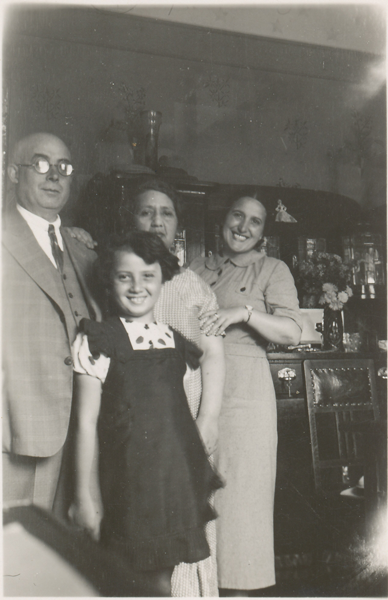 The daughter, Guta, in the black dress whom we saw above is standing behind an older woman. The next photo (below) provided the connection among the previous three photos. 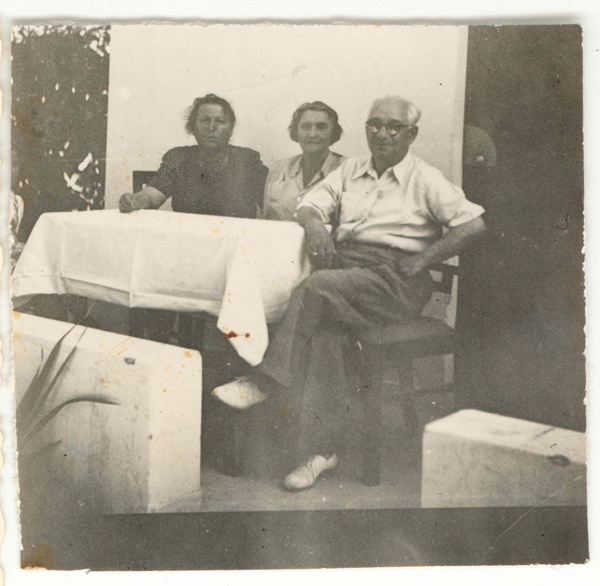 In the photo below, my second cousin, Tolek Borejdo, recognized his grandfather Abraham Moshe as the man standing next to the same brick house as the young woman in the light colored blouse. Abraham Moshe was the brother of my grandmother, Chana Sznajderman. The name of the town where Abraham Moshe lived is hard to pin down. The photo does not have any information on the back. Birth, marriage and death records tell us that Abraham Moshe was born in Pilica in 1874 and married Adela Koenigsberg, , in Zarki in 1897. Adela is the woman next to the sewing machine in the previous photo. Abraham died in Zawiercie in 1938. In 2002, I visited Zawiercie and found his grave next to his parents’ grave. According to the Zawiercie Business Directory (1926-1929), he had a tobacco store in Zawiercie. Adela, his wife, did not survive the Holocaust. She was murdered in Auschwitz. The question remains: where did he live in 1935? The answer is uncertain, but he most likely lived in Zawiercie where we find a hint for his business and where we find his grave. Abraham Moshe and Adela had four children: Dawid, the eldest, born in 1897, Judith, Guta and Maurice. 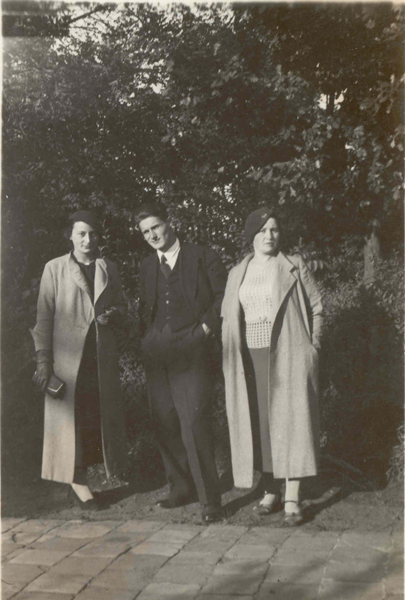 The two young women in the above photos is Guta and Unknown woman and the young man standing between them is also unknown. Currently, I have no way to confirm that my identification of these three people is correct. In 1935 the eldest son Dawid, was already married to Fela Perleman and had a daughter Irene. Fela was born in Bedzin as was their daughter. Fela and Irene did not survive the Holocaust. They were shot to death on a street corner in Katowicz. Dawid’s survival story is long will appear later in the family saga. 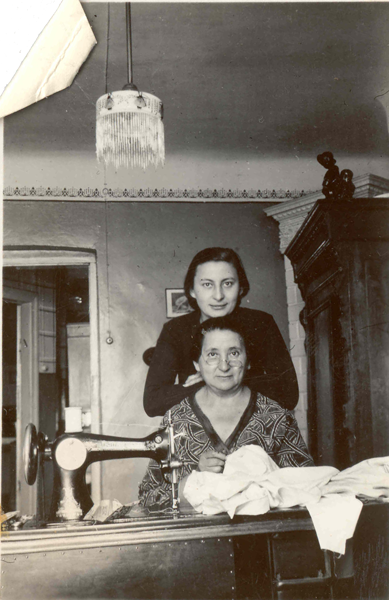 Judith and Guta immigrated to Israel before WWII. Later Judith immigrated to Mexico. As a result of the project I became good friend with Adela, Judith's granddaughter. 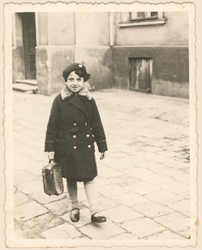 Guta returned to Poland and did not survive the Holocaust. Maurice immigrated to France and survived the Holocaust. Today his granddaughters and I are friends on Facebook. The photos continue to tell us that the Sznajderman family members gathered to meet Ariel and spent some time with him. They invited him to spend a few summer days in Zakopane, a picturesque town on the southern border of Poland, one of Poland's most popular vacation spots back then as well as today. They stayed in Poronin, a small village close to Zakopane, where the residents still keep their old customs and traditions. Ariel visited Zawiercie and paid his respects to the graves of his grandparents, Eygda and Eliezer. 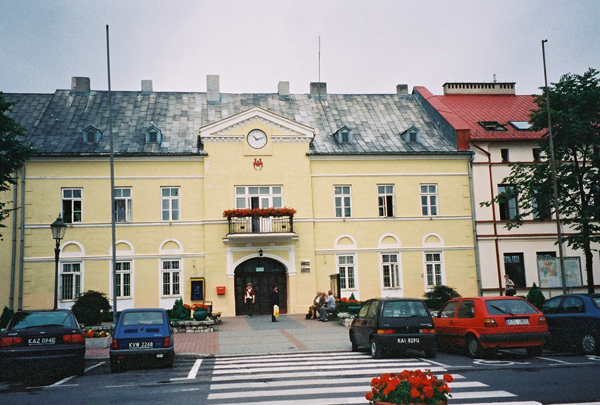 In 2002, Ora and I stopped over in Zawiercie for a short day. We walked through the Zawiercie cemetery and found our great grandparents’ graves, their son Abram Moshe’s grave and the graves of two other Sznajderman Family members. Our experience of standing next to the family graves in Zawiercie inspired and affected Ora’s art. Since then, she has depicted her thoughts and emotions about the family history, as well as the Jewish sorrow in Eastern Europe, in her works of art. She designed a set of enamel art pieces of our great grandmother’s portrait, her grave and details of her kitchen. 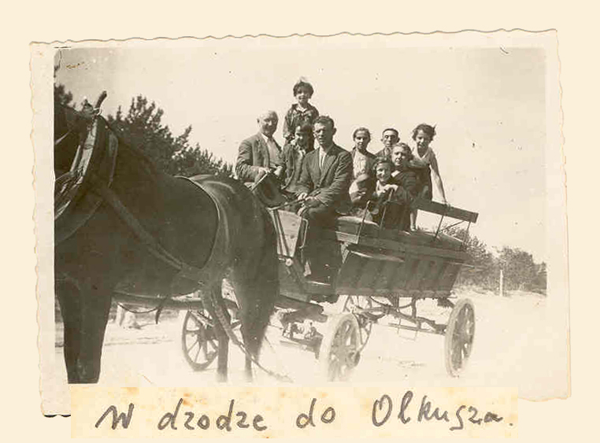 One of the photos in this small collection has the note “On the road to Olkusz” written at the bottom. 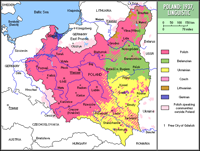 At our extended family gatherings, we heard the names of the towns such as Zawiercie, Czestochowa, and Bedzin, but I do not recall the shtetl of Olkusz ever being mentioned. The photo below presents a group of young and old people riding in a horse drawn-wagon. I did not recognize any of them. 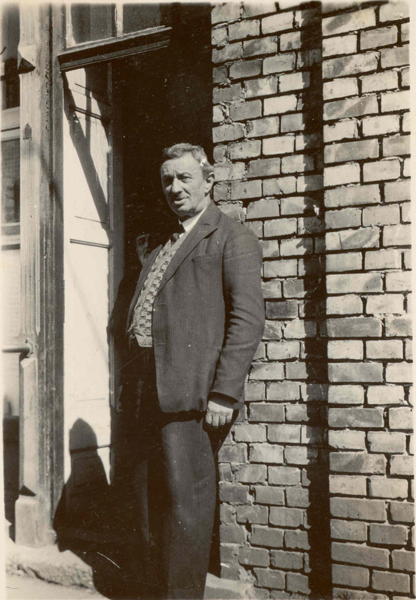 Before I delved deeply into this project to discover my family’s roots, I did not know about the shtetl of Olkusz. Through my search for our ancestors, I found out that the maiden name of our great grandmother, Eygda Sznajderman, was Sztatler. I remembered the name Sztatler coming up in conversations at my grandparents’ home. I interviewed many Sztatler family members who survived the Holocaust. In reviewing the information I have collected in the last several years, I found out that the Sztatler Family had resided in Olkusz since at least 1816. 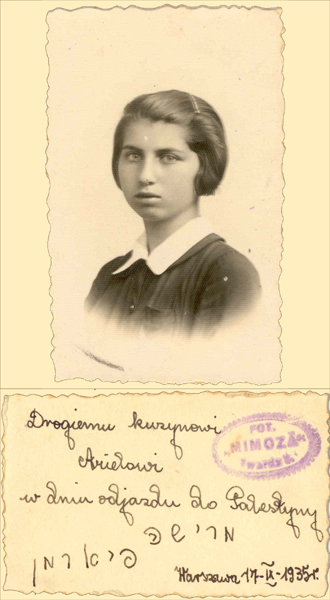 Eygda Sznajderman née Sztatler was born and married in Olkusz. Between the years 1907 to 1942, 41 members of the Sztatler family were born, married and died in Olkusz. 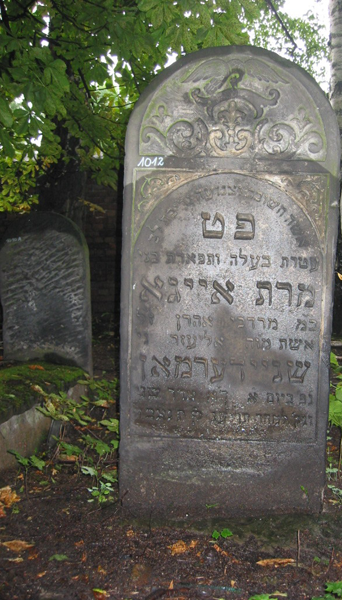 I do not know whether the Sztatlers in Olkusz were in close contact with the family in Israel, or perhaps Abraham Moshe Sznajderman told Ariel to visit the family in Olkusz. As we see from the photo, Ariel took the time to visit the Sztatler family in Olkusz. I wish I could identify the members of the group. In a separate essay, I will publish the birth, marriage, and death records of the Sztatler family in Olkusz and I will try to show their relation to our family. In 2002 we visited Olkusz, we walked through the town square and visited the Olkusz Registery Office but there was no sign for Olkusz Synagogue and the cemetery was badly preserved. I found in the site www.sztetl.org.pl a photo of Olkusz Synagogue.The Synagogue was devastated during the Holocaust. It was demolished in 1950. The story does not end with the last photo. There is at least one more chapter with no photos. In 1935, the number of photographs one could take on a trip depended on a number of factors: the photos had to fit on rolls of film, so the number of rolls one took on a trip might limit the photos produced, and furthermore, the photos had to be successfully developed. We can assume that many of these limitations explain the absence of photographic documentation in some parts of Ariel's journey in Poland. Ariel visited the Szperling branch of the Kaluzynski family in Piotrokow. You might wonder, if there are no photos from Piotrkow, how do we know about the visit? Figuring this out was quite simple. The following tree demonstrates the relationship between Rina Irmay née Zacks and Ariel Arieli-Kaluzynski. Ariel and Rina were second cousins. 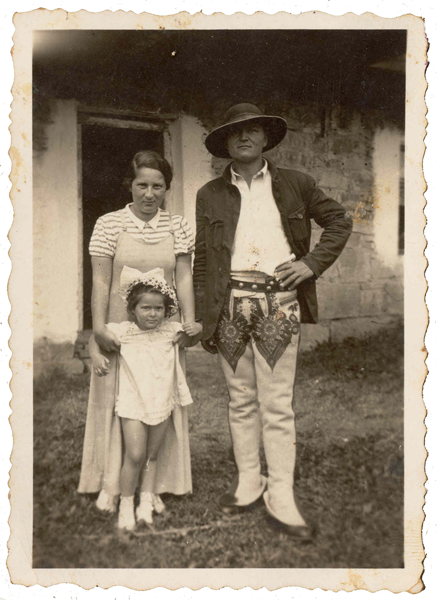 Ariel’s grandfather Abraham and Rina’s grandmother were siblings. Rina immigrated to Israel in 1945 and since then she was always in touch with my father, Ariel. Ariel’s death in 1978 ended close connection with his extended family, but fortunately my father introduced me to Rina Irmay when I studied in the Technion. I lived next to the Irmay family on a small, green alley in Neveh Sha’anan during my first year in the Technion and we became very close friends. Rina knows about my genealogy research and she is an inexhaustible source of information. She herself, with her infinite courage and strength, survived the Holocaust. I will tell her remarkable story in a separate chapter. “Of course,” answered Rina. Her voice was full of light and love. “How did Ariel know about you?” I asked. 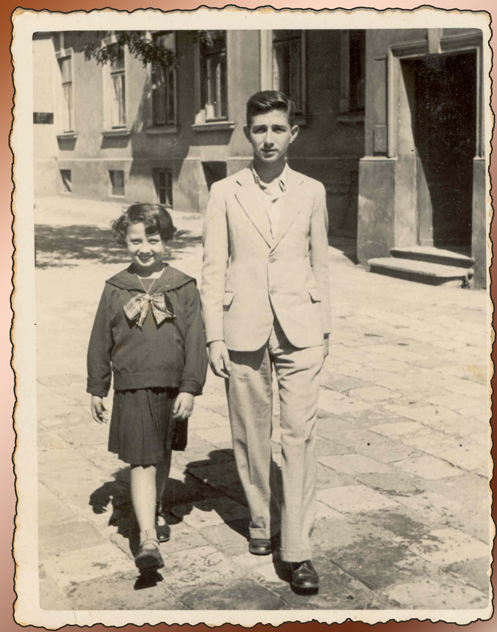 “I remember his visit as if it was yesterday,” added Rina, who was 14 years old when my father visited the family. Slowly I reconstructed my memories of Sabina. Sabina’s maiden name was Szperling, and her married name was Ankilewicz. The Ankilewicz family had a florist shop on Allenby Street in Tel Aviv, not far from our family’s printing press. The two families, Kaluzynski and Ankilewicz, were close. The Ankilewiczes visited my grandparents frequently. I do not remember whether they brought flowers when they visited. At the time, I was familiar with members of the Ankilewicz family, but I did not know the exact relationship. Today I know that Sabina was my grandfather Yosef’s first cousin, Rina’s aunt. I assume that my grandfather consulted Sabina before Ariel went on his trip, and that is how Piotrkow made its way into his itinerary. 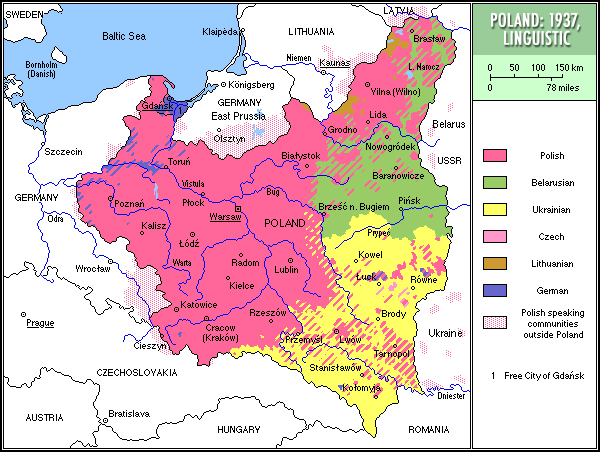 Poland, at the end of 1935. It is already November and the weather is cold. How long did Ariel stay in Poland? Did he leave in September? Did Stefa send him the photo later by mail? The photos hide more than they reveal. We see faces, at moments when the family gathered with their guest, and also rare glimpses into their life in Europe. Nevertheless, these few momentos are dear to everyone in the family who left Poland before WWII or survived the Holocaust. My sisters remember that my father kept saying that he feels guilty for not encouraging the family in Poland to pack their belongings and immigrate to Israel. Ora's memories about our father's expressions of guilt go beyond his collective feelings. She remembers his telling her repeatedly about a young girl who was not home at the time of his departure. "I did not say goodbye to the young girl, and then a few years later she was murdered by the Nazis," Ariel said. Who is the young girl? Is she Stefa Kaluzynski, Mariszia Fajerman, Irene Sznajderman? The following are names of some of the family members whom my father met during his journey and did not survive the Holocaust. I hope my story will keep them alive forever in the memory of my extended family. With this sad memorial the story of my father's journey to an end, but it opens the way to a chain of stories that can continue to assemble from memories, photos and archives.